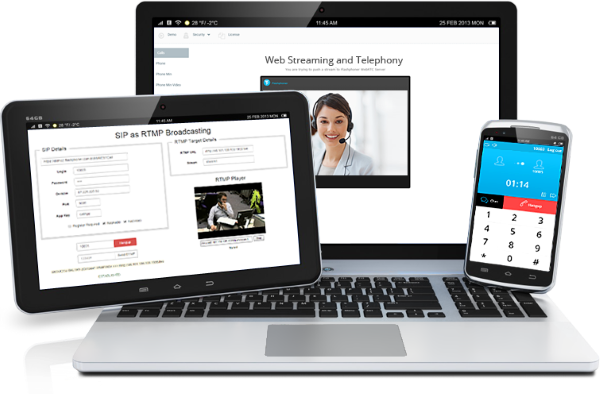 We release the fifth version of Web Call Server – a software server platform for streaming video and telephony web applications. Web Call Server 5 received a lot of new features including delivery of SIP calls to RTMP servers and CDN, Websocket broadcasting on iOS Safari and the brand new iOS SDK. Streaming video services and messengers rapidly gain popularity in the Internet. A bulk of protocols, browsers and connection scenarios implies the use of a unified platform able to provide seamless communication regardless of the source of a video stream and involved browsers and operating systems. One such platform is Web Call Server 5 – a multi-protocol server designed to effortlessly integrate various software and hardware solutions, be that browsers, VoIP online conference services, softphones, SIP switches, IP cameras and more. Web Call Server easily deploys on VPS or a dedicated server, a group of servers or in the cloud, and plays a role of a server engine for video chats, broadcasts, browser calls, webinars and any other uses that require real-time playback of streaming video in a browser or on a mobile device. The fifth version of Web Call Server embodies 5 years of development, thousands of hours of tests, hundreds of bug fixes and improvements. The list of new functions includes broadcasting to iOS Safari browser via the Websocket protocol, delivery of SIP calls to RTMP servers and CDN for mass broadcasting, the support for RTSP serve operation mode and recording video streams from the browser on the server. Web Call Server 5 adds the screen sharing feature to broadcast browser window contents, introduces the new administrator web interface with apparent demo and offers iOS SDK for WebRTC calls and streaming. Thorough testing of the new version of the platform on poor network connections resulted in enhanced quality of streaming video and calls, while the streaming processing overall has been improved, debugged and highly optimized for even better performance. We meant to release a minor update Web Call Server 4.1 as planned, but changes to the server were so colossal and the functionality improved so radically, that we decided to release a major version instead and named it version 5.